True Touch Retention Essence replaces Retention Plus . Supports the appearance of firm, taut, resilient skin. TrueTouch® Retention Essence is a nourishing serum to energise the look of surface vitality, supporting the appearance of tautness, firmness, resilience, and minimising the appearance of aging. Lush with botanicals and added vitamins, Retention Essence moisturises and complements skin’s defenses, buoying surface bounce and flex, enhancing the appearance of smooth skin as it deftly encourages the delivery of action ingredients, preserving skin’s youthful appearance. Moisturises and enhances skin volume with naturally-occurring components of firmness and resilience, plumping the appearance of the skin. Buoys surface bounce and flex, preserving skin’s youthful look. 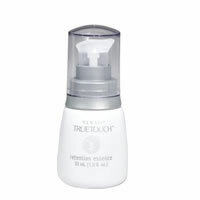 Energises the look of surface vitality; moisturises and complements the skin’s natural defences. Encourages the delivery of action ingredients to the skin, maximising potential benefits. Features an EU-allergen friendly fragrance blend. Apply Retention Essence to area of concern. Massage in well. Gotu Kola—this herbaceous extract promotes youthfulness by minimising appearance of unsightly skin for a beautiful appearance. Banana Flower—This skin conditioning ingredient provides a smooth and supple complexion while diminishing the appearance of flaws on the skin. Water (aqua), octyldecanol, butylene glycol, C12-15 alkyl benzoate, microcrystalline cellulose, potassium olivoyl hydrolyzed wheat protein, hydroxyethyl urea, cetearyl alcohol, glyceryl oleate, glyceryl stearate, olivoyl hydrolyzed wheat protein, caprylyl glycol, cellulose gum, tetrahexyldecyl ascorbate, secale cereal (rye) seed extract, panax ginseng root extract, stearyl glycyrrhetinate, juglans regia (walnut) seed extract, hydrolyzed lepidium meyenii root, 1,2-hexanediol, gynostemma pentaphyllum extract, ethoxydiglycol, hydrolyzed elastin, retinyl palmitate, centella asiatica extract, musa sapientum (banana) flower extract, disodium EDTA, fragrance (parfum), phenoxyethanol, chlorphenesin.